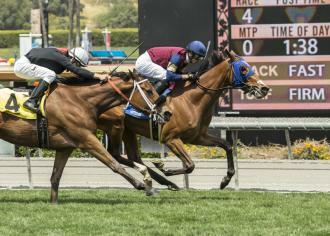 Sparkman: European pedigrees sending back stamina to U.S.
Queen Blossom, winning the 12-furlong Santa Barbara, is by American-bred, European-based stallion Jeremy. The American equine conquest of Europe that began with Sir Ivor’s victories in the 1968 2000 Guineas and Epsom Derby revolutionized the international breeding industry. The American Thoroughbred, after decades of crossing the tough, sound racemares required by American dirt tracks with more refined, European stallions had reached a pinnacle heretofore unseen that resulted in the 1970's onslaught of Secretariat, Ruffian, Seattle Slew, Affirmed, Alydar, and Spectacular Bid. That same decade, though, saw Nijinsky II, Mill Reef, Roberto, Allez France, Dahlia, Alleged, and countless others American-breds complete the transformation of European racing. The export of thousands of elite-pedigreed horses depleted the American gene pool and enriched that of Europe to the extent that by the 1990s, when American breeders turned their focus to dirt horses, the European Thoroughbred had regained at least equal footing with America. The Americanization of the European Thoroughbred reached its pinnacle with the undefeated Frankel, whose pedigree is entirely American in the third generation except for the German-bred Allegretta. Not surprisingly, the class shift toward Europe has been particularly visible in longer American turf races, which are routinely won these days by European imports like Queen Blossom, winner of the Grade 3 Santa Barbara Handicap over 1 ½ miles at Santa Anita last Saturday. Bred in Ireland by the Irish National Stud, Queen Blossom is by Jeremy, a grandson of American-bred Danehill, out of Mark of An Angel, by Mark of Esteem, a great-grandson of Mill Reef, and her fourth dam is the American-bred Seattle Sway, by Seattle Slew. As has become typical in European pedigrees these days, American names predominate in her pedigree, with 19 of the 32 horses in her fifth generation American-bred. Her sire, Jeremy, was actually bred in Kentucky by Brookdale Farm, and sold to Brushwood Stable for $375,000 at the 2003 Keeneland September yearling sale. Brookdale had purchased Jeremy’s dam, in foal to Danehill Dancer, for about $220,000, Alexandra Scrope, agent, at the 2002 Tattersalls December sale. Trained in England by Sir Michael Stoute, Jeremy was a high-class miler, winning 4 of 16 stats from 2 to 4, including the Group 2 Betfred Mile and Group 3 Jersey Stakes, and was beaten only a nose in the Group 1 Queen Anne. Retired to the Irish National Stud in 2008, he achieved only modest success, siring 15 stakes winners from 668 foals, led by Group 2 winners Kool Kompany (out of Absolutely Cool, by Indian Ridge) and Success Days (Malaica, by Roi Gironde). His sire, Danehill Dancer, though, was one of many successful sire sons of Danehill, and is the only horse other than Galileo to lead the English sire list since 2008. Sire of 181 stakes winners, Danehill Dancer led that list in 2009, when his best son, Mastercraftsman, won the Irish 2000 Guineas. Jeremy’s dam, Glint in Her Eye, by the American-bred European and American champion Arazi, was half-sister to another of the world’s great sires, Japan’s greatest racehorse Deep Impact, by Sunday Silence, from one of the best families in the English Stud Book. Queen Blossom is the third foal and only stakes winner to date out of Mark of An Angel, who placed in the Group 3 Silver Flash Stakes at Leopardstown. Mark of An Angel has since produced the placed 3-year-old filly Winged Spur, by Motivator; the unraced 2-year-old filly Rachel Zane, by Sea The Moon; and a yearling colt by Lawman. Her sire, Mark of Esteem, won the 1996 2000 Guineas and earned champion miler status in Europe. He was a moderately successful stallion, his 30 stakes winners headed by Epsom Derby winner Sir Percy. His career as a broodmare sire has followed a similar pattern, with the 46 stakes winners produced by his daughters headed by Irish Derby winner Treasure Beach; French Oaks winner Avenir Certain; and St. Leger winner Masked Marvel. Queen Blossom’s English-bred third dam Grey Angel, by the French champion Kenmare, won five stakes in South Africa, including the Group 3 Racecourse Bookmakers Handicap and Gosforth Park Fillies & Mares Stakes, but produced nothing of note. Her dam, Seattle Sway, by Seattle Slew, was bred in New York by Empire Stud, and sold for $600,000 to Sheikh Mohammed bin Rashid al Maktoum at the 1983 Fasig-Tipton Saratoga yearling sale. Seattle Sway won only a maiden race in England, but was half-sister to Santa Lucia Handicap winner Finance Charge, by Pretense, dam of California Oaks winner General Charge, by General Assembly, and stakes winner Credit Approved, by Incinderator. Until Seattle Sway’s export, Queen Blossom’s female line had been resident in America since her 18th dam, Maria Black, by Filho da Puta, was imported from England in the 1830s.